Field goal percentage is misleading. We know that, because if it wasn't, Tyson Chandler wouldn't threaten to break 70 percent every year, and Reggie Evans would produce a literal black hole in each of his box scores, which would consume their immediate surroundings and we'd have no idea what happened in any Nets games. Kirk Goldsberry's got something better. 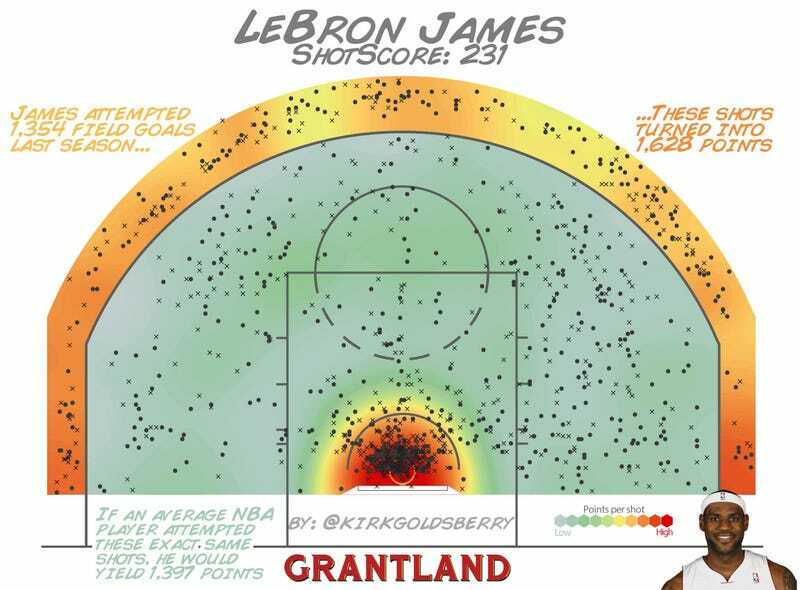 Over at Grantland, Goldsberry has a new stat he's calling ShotScore. It's based on where each shot a player takes comes from on the floor, and how well the league as a whole shoots from that spot. Sound complicated? It's not. Look at the image at the top of this post—it's basically a hot-and-cold chart of how efficiently the entire NBA scores from given parts of the floor. And when you layer all the shots a given player takes over top of it, you figure out how far above or below average they're doing. To oversimplify, it's VORP for NBA scoring. By this measure, LeBron, Kevin Durant, and Stephen Curry are the most effective scorers. Goldsberry also breaks this out for outside shooting, where Steph is the most productive from outside, generating a ton of points (but per 100 shots he actually falls fourth, behind some injured or low-usage players). The way it's introduced is a little clunky—broadly, it's supposed to be a way to determine that LeBron is a better scorer than DeAndre Jordan, even though Jordan has a better FG%, but we know that. That's just for the totally uninitiated, though. For the rest of us, there's real usefulness here if we can get updated standings throughout the season. An example: We did a list of 32 infographics for the 32 NFL offenses last week. They went by Football Outsiders' DYAR, which expresses how much a player has actually produced on the field, adjusted for opponent strength and game situation. By this measure, AJ Green has kind of sucked this year. We know AJ Green is good, but he's playing poorly. That's interesting. And that's the kind of thing you'll be able to suss out with Goldsberry's new metric. Is Carmelo scoring effectively this season? Are you sure? Because Goldsberry is right: there's no one way to see how well a player is scoring. We have true shooting percentage, which mashes together FG%, 3PT%, and FT%, but that can still favor low usage players or the rare interior big man who shoots well from the stripe a little heavily. For the most part, though, you end up eyeballing PER, TS%, usage, turnover rate, and a bunch of other interconnected-but-not-encompassing stats to get a picture of a player's performance. This probably isn't the end-all stat, mostly because it's unclear how often we'll be able to look in on ShotScore standings, but it's great tool for explaining, at a glance, who's playing the best.